The box art and release date for the rumoured Assassin’s Creed Collection on Nintendo Switch may have finally surfaced. This new potential leak comes from Czech retailer Herni Svet, who have seemingly listed the product early. The Assassin’s Creed Collection for Nintendo Switch appears to have become one of the worst kept secrets in the games industry. Despite not having been officially announced, the compilation title has seen multiple retailer listings pop up since December 2018. Now, thanks to an additional listing discovered on Reddit, we may know when the game is planned to hit shelves. 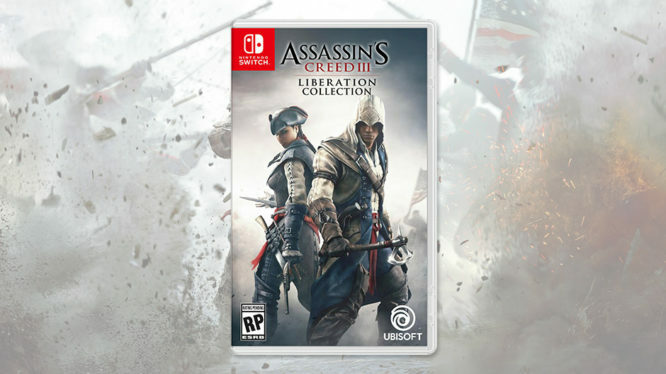 Previously only known as “Assassin’s Creed Compilation”, the box art shown on Herni Svet suggests the Nintendo Switch release may actually bear the title “Assassin’s Creed III: Liberation Collection”. This compilation game will apparently include remastered versions of Assassin’s Creed III and Assassin’s Creed Liberation and is listed as releasing on February 15th 2019 in Europe. Unlike past retailer listings, the inclusion of previously unseen box art does add some additional fuel to fire. However, it’s worth noting that the image provided by the retailer features an ESRB “Rating Pending” mark instead of the expected European PEGI equivalent. Considering the number of potential leaks leading up to this one, it’s seeming more likely every day that an Assassin’s Creed Liberation Collection is heading to the Nintendo Switch. As with all unconfirmed releases though, it’s probably best to wait until an official announcement before putting too much faith into it.